This came fast. Was well packaged. It actually fits and looks just like the picture. It's light yet sturdy and made of scratch resistant rubber. I got it for the drain stopper in the laundry room sink. 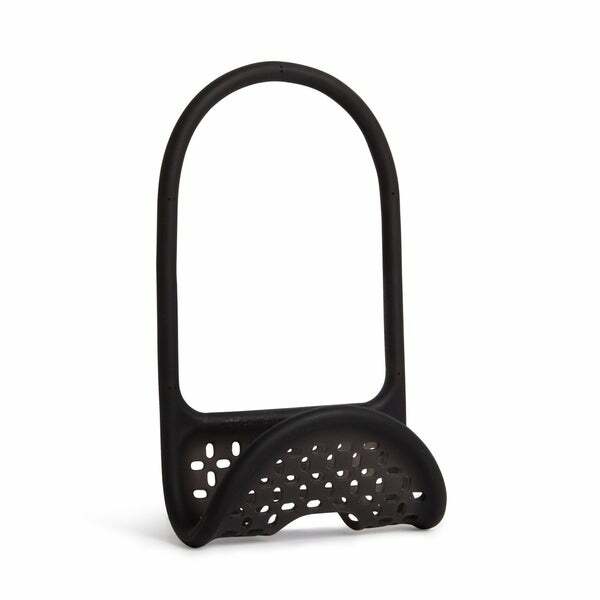 Unlike other sponge or cleaning brush holders on the market, Sling Caddy by Umbra is a flexible Soap, Sponge or Cleaning Brush holder for your sink. 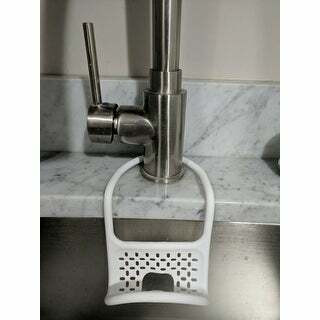 The Sling Caddy is a plastic-coated wire that forms to the shape of your sink. The Sling Sink Caddy was designed with a plastic that was specifically chosen for its elastic properties to allow the caddy to hang around any faucet neck or sink wall. The openness of the cutouts and perforated base promote drainage, prevent moisture buildup and growth of mold in addition to allowing your sponge or dish brush dry when not in use. The compact design keeps your kitchen countertops clutter free, eliminating mess around the sink. Available in Black, White or Red.